I love the soundtrack of a city. It is a hodgepodge of sounds. Sometimes harmonious. Sometimes just noise. The above photo was taken at Portland’s Saturday Market. 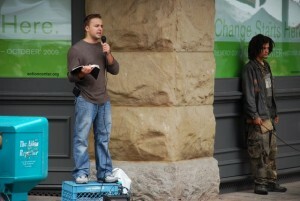 On the left is a street preacher. 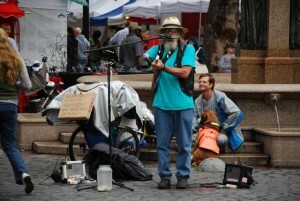 On the right is a street musician. The audio clip above was recorded and not mixed. Give a listen. At first I thought these two were at odds, trying to drown each other out. But the more I listened, the more they seemed to fit together–as if the musician was providing the urban soundtrack to the sermon. You also get an AMTRAK train and a street drummer across the street into the mix. Harmony? Noise? You decide. It is all part of the eclectic sounds of the city. Portland cyclists come in every size, shape, style and color. OK, maybe not so many colors unless you include colorful jerseys worn by racers. It’s a cyclist’s playground with fun for everyone. Want a family ride away from traffic? 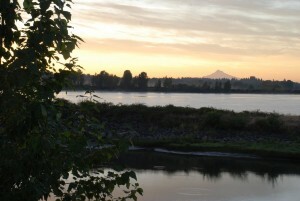 Just head to the Eastbank Esplanade trail and Waterfront Park on the west side of the Willamette River. You can even loop around to connect with the Springwater Trail as we were encouraged to do by a mom, dad and two kids snacking at the Hawthorne food cart lot one afternoon. Want to put on some miles and get some saddle time? Jump on the Marine Trail and head toward Blue Lake along the Columbia River where we met a cross-country cyclist just back from riding the Adventure Cyclist Southern Tier route. Just want to get to work and avoid the parking cost and hassles? Bike Boulevards lead to bridges crossing the river from residential to downtown with dedicated bike lanes making the commute so safe and easy you could do it in your skirt or dress pants. Need a sprint workout to cross train? We met runner Ruben at the top of the in-city volcano Mt Tabor looking fresh while I’m a little winded. Want to meet friends for breakfast? Well, there’s any number of great cafes and all come with plentiful bike parking out front and no Lycra is required. Need a respite from the city? 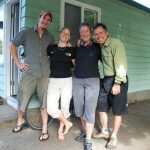 Look no further than a pedal around Sauvie Island where we even found a place to camp for the night. It’s sill within city limits but this island of peaceful farmland and wildlife refuge will feel like you are far from home. We sampled these rides and more in the last week. No doubt there is something for racers and mountain bikers and tandem riders and … you get the picture. Portlanders don’t just ride bikes for sport or exercise, like cyclists everywhere, they ride bikes for life, happiness, thrift, the environment, transportation, family-time and a multitude of other reasons. Bike riders come in all different flavors and the Portland bike infrastructure attempts to address the varied needs and interests. All cyclists benefit from increased awareness and visibility created by the greater number of bikes and greater number of bike advocates. In Portland, we tasted the sweet life as part of a bike-culture and not just bikes on the fringe of car-culture, and it tasted good! Alright. 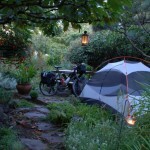 A week-long bicycle journey in the city limits of Portland with no hotel reservations. How did we do it? Crashed on the floor of a delightful couple we met on the river trail. 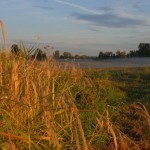 Camped on Sauvie Island. Camping costs $17, but it’s $12 if you arrive by bike. Camped in the backyard of our old Beacon Hill neighbor Albert. We ran into him at the Cup and Saucer Cafe. Slept on a futon at Ruben’s house. We met Ruben up on Mt. Tabor Park. Wednesdays are car-free. Camped on the property of Eric and Mary. 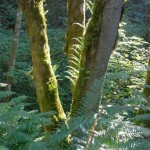 They live high up off of McNamee Rd on land they purchased and re-forested. Planting more than 2,000 trees! Camped in the garden of our friends Bruce and Andrea. We met them on the border of Thailand and Burma on our SE Asia bike trip. New found friends and a connection with Portland we never could have achieved on a package tour with hotels: Priceless! Are Your Friends Making You Bike? While riding down on the train for our bike trip within the city limits of Portland, Kat and I read Clive Thompson’s article Are Your Friends Making You Fat? in the New York Times Sunday Magazine. The article goes into great detail about how our social networks influence us. Obesity, smoking, happiness and loneliness spread through our social networks. If you hang out with people who overeat … you will tend to overeat as well. Hang out with a bunch of happy campers, and you’ll most likely be one yourself. Well, after a week in Portland, I can say it works for cycling as well. 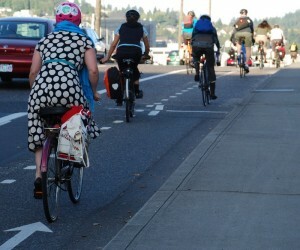 The popularity of cycling is riding a bigger and bigger social network wave. 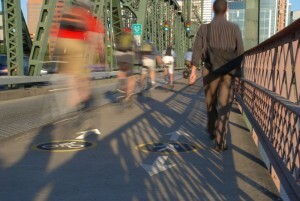 If you work in Portland, you are bound to have several workmates who bike to work. Many of your classmates cycle if you are in school. If you live in Portland your boss, teacher, lover, dog-walker, waiter, plumber or tax accountant is more likely to get around by bicycle than in most cities in America. So you are more likely to bike as well. To stand on the Hawthorne bridge during rush hour and watch thousands and thousands of cyclists crossing the river on their way into downtown, is to witness an amazing social phenomenon. I talked with a cook at fabulous rib joint where we ate lunch. But this social success comes only after years and years of advocacy and public policy and progressive politicians willing to make sometimes unpopular decisions. 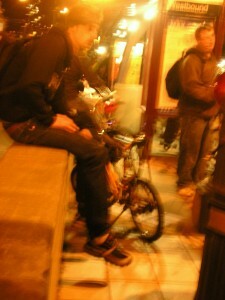 To ride a bike is cool, trendy, hip and environmentally conscious. For some, it is all of those things–for others, it is just transportation. But most of all, to ride a bike is to be a Portlander. Do you have friends who live in Portland? If so, they probably ride bikes. And according to Clive Thompson’s article … they make you more likely to ride one as well. 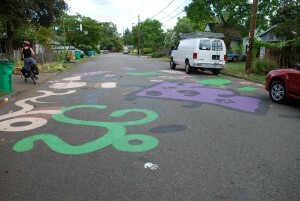 Citizens of Portland on occasion have taken it into their own hands to calm traffic in their neighborhoods. 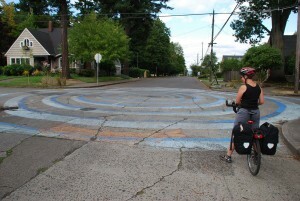 We rode our bikes over a hand-painted traffic circle at a wide and inviting intersection otherwise unmarked. Further along Alberta is a playful house with whimsical shapes painted on the street. I have no idea if this is legal, but it certainly made us take notice … take the time to stop and look. And isn’t that what we want at intersections? Hurray for those artist’s statements. We’ve logged mile after mile on Portland’s designated bicycle boulevards. They are marvelous routes crisscrossing the city on quiet, residential streets extending for for blocks or miles to get us to most neighborhoods. Along many boulevard intersections are 4-way stops (and I hear of movement to make a “rolling stop” legal) or small traffic circles to keep vehicle traffic from using these streets as cut-throughs. Today we were heading east on Tillamook and I realized only stripes of paint served to slow traffic and give direction for where bikes would cross a challenging intersection. So simple. So safe and effective. Similarly simple and effective are bike lanes in high-traffic areas that are painted bright green with “bike boxes” where bikes would gathering ahead of cars to cross when a light turns green. 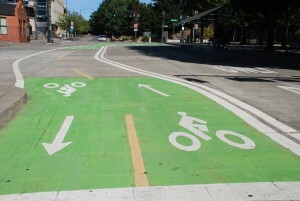 This gives drivers and cyclists clear direction on where each should go. The cost to society? The price of paint and a traffic engineers time to identify the elegantly simple solution. 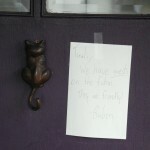 Every day we rely on the kindness of strangers. It’s easy when riding a loaded touring bicycle to strike up a conversation. The bike and gear are always conversation starters. So when the down-and-out couple on the bus asked how we get around on bikes with all that stuff, I told them we had just hooked the bags on our bikes, rode out to Sauvie Island for the night and camped. They said they camped too … right up that hill on a little path. They said they’d had grilled cheese and chili for dinner and wondered what we’d had. Rice with some spicy chickpea stew, I answered. “Tonight we’re having pork chops!” they announced. And I joked it sounded like we should stop by for dinner. Then they got down to the business of giving us directions to their camp in Forest Park, and I think they surely would share their meal. I thanked them as we got off the bus and said I didn’t think we would be coming out that way again this week, but if I did, I would look them up. Good day, friends, and bon appetite! To the Burbs and Beyond! We’re exploring Portland’s famed bikeability, so we decided to test the waters outside the city limits. 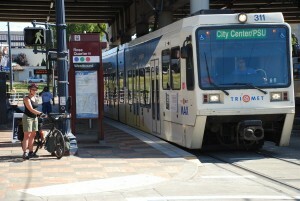 With our all-day TriMet pass, we were free to hop any light rail train and head to the end of the line. I decided to head to Hilsboro. 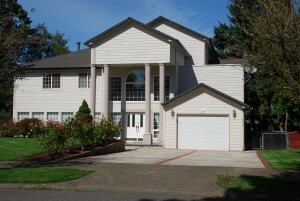 I knew nothing about the area west of Portland proper, and rarely did I hear people talk about the suburbs of Beaverton and beyond. But truth be told, I also chose Hilsboro because my main motivator for just about anything is the promise of tasty food. Some how I got it in my head that a bakery I read about that served exquisite hand pies was located in Hilsboro, so I convinced Willie that this was the stop for us. Only after we boarded the train did I let mention how I came to select this destination. After 30 minutes and increasing evidence of track housing with wide, winding streets and little amenities grew suspicious. After 45 minutes, with the train seeming to stop every mile or two, I was downright sceptical I would find a culinary delight. At long last, we came to our stop and took our loaded bicycles down from the hanging racks on the Max. Once on the platform I could get into my pack and reconfirm the address … which turned out to be in Hilsdale. Oops. Riding back through the area we just came through on light rail did not seem like the best use of our time to see the best of Portland and environs. We had a lot of ground to cover and few good bicycle-friendly routes. So we cut our journey in half and went back to a Beaverton stop where we could see a route on our map that would take us to a dedicated bike path ending at Washington Park … and a chance to relive the zoo ride in the daylight. Immediately missing from the roads in outer-Portland suburbs are the bicycle road signs. All over Portland, bike routes with destinations, mileage and time serve as way-finders for those not following a bicycle map like we were. But in Beaverton, we hunted and pecked our way to the beginning of the trail … needing a little help from a motorist who set us straight. Nothing indicated a major bike route was close. No street signs. No marks on the pavement. No welcome to the path sign we had seen on other routes. The bike route was functional, and sometimes even pleasant, but not what we had come to expect from routes inside the city limits. As the route crossed over Hwy 26 we saw our first sign and I suspect that’s when we were back in Portland proper. From there on in, we followed signs posted on light poles all the way to downtown. Lodging Sunday night: Are you Willie? Our goal is to spend a week traveling in Portland with camping supplies in tow, and see what happens. No hotels. No hostel. This is easy out in the countryside or in small towns, but cities can be lonely places crammed with lots of people. “Are you Willie?” I turned to see a tall, young man asking me. Kat and I were down by the river, working out a loop of the excellent trails Portland provides. “Yes” I answered with surprise. How did this stranger know me? That is how we met our first hosts. 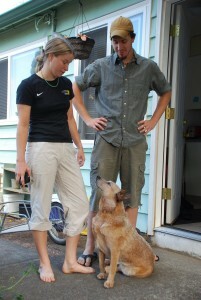 Kelly and Ben … and their dog Silka. 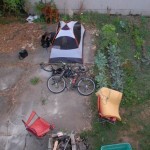 They said it would not be a problem to pitch our tent in the courtyard of their apartment complex. We mentioned that we were going to check out Zoo Bombing and invited them to join us. So B en and Kelly provided us with our first night’s lodging and hours of laughter and conversation, and we provided them with an excuse to try out a legendary Portland event. We roll down hill one last time. Third times a charm and I relax into it. Savor the night air, perking up in the chill as we bomb downhill and into the city lights. Rounding up near PG Stadium, the kids gather. The guy with Bart Simpson on his bike asks if we had fun. Without a doubt, that’s fun. It’s a little crazy. It’s a little reckless. We pedal off, seeing Portland in a different light, the adrenaline still pumping in our veins.